For those looking to enhance their daily nutritional intake, our line of Nutra Naturally Drink Mixes provides the highest quality blends in a convenient easy to use powder form!. 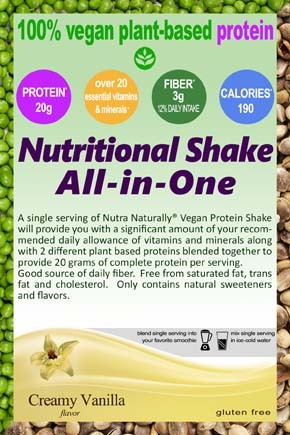 Single serving of Nutra Naturally® Vegan Protein Shake will provide you with a significant amount of your recommended daily allowance of vitamins and minerals along with 2 different plant based proteins blended together to provide 20 grams of complete protein per serving. Good source of daily fiber. 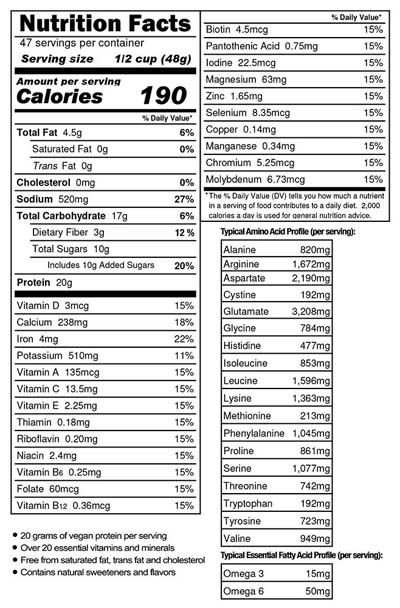 Free from saturated fat, trans fat and cholesterol. Only contains natural sweeteners and flavors. Soy Free - Gluten Free - Dairy Free Mixes excellent. Mix or shake into tall glass of cold water or blend with your favorite smoothie. An excellent protein source for athletes, people on the go, body builders and body sculpting, weight-conscious, diet & health conscious people, or those who want to supplement their nutrition.